Hail Matrix – A reference guide used to determine PDR hail repair pricing estimates. The hail matrix is a tool used to write hail repair estimates. There are many variations but most of them follow a chart like form similar to the old multiplication tables. Typically, each vehicle panel is listed down the left side and the dent count and size are listed above. An adjuster or PDR Tech would simply count the dents on a panel, figure out the average size of the dents and this would indicate the price for that panel. For example, according to the chart on the right, a hood with 3 dime sized dents would cost $75 to repair. A roof with 7 quarter sized dents would cost $225. There are other factors which may influence the actual repair price such as the depth of the dents or the location of the dents on a panel and their access. R&I times would also be included on the matrix and would be included in the estimate. There is also an area to list damaged parts, prior damage and other notes. Although there have been estimating software programs for computers for years, they have recently boomed in popularity. The use of smartphones and tablets have made digital matrix charts very popular for writing hail repair estimates in the field. Most use a vin scanner and decoder code that allows the user to take a picture of the Vehicle Identification Number Plate with their device and the year, make, model, color and other details about the vehicle will automatically populate. Then the user can input information about the vehicle owner and then the damage itself. No matter how fancy the apps and software become, almost all of them are still based off the hail matrix ideas. 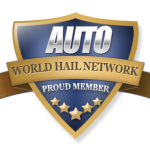 Helping unite the hail repair people & companies around the globe. Raising industry standards by sharing best practices. Read about the next term: Micro-Fracture – Paint cracks that are not visible to the naked eye. Find a repair company in your area now that you understand aluminum repairs.